Suitable for 480 x 800 resolution LCD displays, automotive navigation and entertainment systems, digital copiers, laser printers, network switches/routers and base stations. MAXIM Integrated Products, represented in Australia by Arrow Electronics , has released the MAX9217 and MAX9218 high-speed LVDS serialiser-deserialisers. They serialise 27 lines into a single dc-balanced twisted pair or differential line for improved EMI and low-cost routing. Dc-balancing reduces the effects of low-frequency ground fluctuations while the serial LVDS link reduces the number of wires or traces from 28 to two, saving cost and dramatically reducing EMI. The LVDS inputs and outputs meet the requirements of the ANSI TIA/EIA 644 LVDS standard. The MAX9217 serialiser and MAX9218 deserialiser are suitable for 480 x 800 resolution LCD displays, automotive navigation and entertainment systems, digital copiers, laser printers, network switches/routers and base stations. The MAX9217 serialises 18 bits of LVTTL/LVCMOS RGB digital video data, nine bits of LVTTL/LVCMOS control data and a clock into a single LVDS serial clock and data stream. The MAX9218 deserialises a single LVDS serial input into 27 single-ended LVTTL/LVCMOS outputs. The MAX9217 and MAX9218 have dc-balanced outputs which use ac coupling to allow isolation between serialiser and deserialiser. The dc-balanced feature reduces bit errors in the MAX9218 deserialiser due to shift in the common mode caused by ground shift. The maximum aggregate payload data rate is 700Mbps. The MAX9217 operates from a 3.3V (±10%) core supply and features a separate input supply for interfacing to 1.8V to 3.3V logic levels. The MAX9218 features a separate output supply for interfacing to 1.8V to 3.3V logic-level inputs. Both devices are specified for operation from -40ºC to 85ºC. The LVDS inputs and outputs meet the ISO 10605 specification (±30kV air, ±10kV contact). 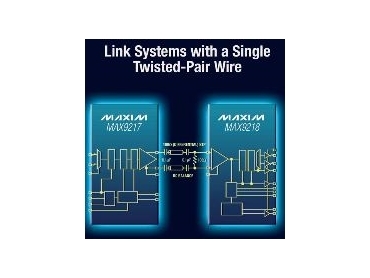 The MAX9217 and MAX9218 are available in 48-pin TQFP or QFN packages.